I was half way through the book before I turned the light out, and I wasn’t able to resist finishing it the next day. No, I can’t pretend to be unbiased about this book. I loved every word of it, even the page that made me blush because Ros had been kind enough to mention me in the chapter about Alan’s literary legacy. Ros writes like a natural – I can hear her voice telling these stories as if we were chatting over coffee, and it’s been lovely to learn her life story, and her love story too. Ros makes some serious points too in this lovely, lively memoir. She discusses the importance of remembering. It’s important for all of us, but it’s especially important for Jews because of the history of anti-Semitism. Tracing families back before the Holocaust and the pogroms in Russia and Eastern Europe is a responsibility. That’s why there are family trees in the back of the book, and vignettes about the individuals who comprise them. They are, as the blurb says, both noteworthy and not-so worthy and Ros has managed to make reading about them entertaining, poignant, and sobering. No mean feat. I found it fascinating to read about the early years of the Collins marriage in 1950s Melbourne. They lived away from the St Kilda Jewish community, making a home in Box Hill, and as her family grew along with Melbourne’s suburbs, Ros did what so many of us did, took up the opportunity offered by Gough Whitlams’ university reforms and completed her education. I know so many women who did this, it still staggers me that women of such talent and intellectual ability were so very nearly denied their chance. Australia would have been the poorer if Ros hadn’t qualified in librarianship and had the vision to make the Makor library into the inclusive national resource that it is today. 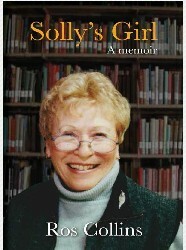 It was her belief that sharing information would lead to sharing values and promoting tolerance – values that shine through this memoir from start to finish. (It’s a measure of Ros’s self-deprecating style that I had to read this book to learn that she was awarded Woman Achiever of the Year 1999 by the National Council of Jewish Women. This was, by the way, the year before her 70th birthday when she finally retired. And did I know that she received an award in 2010 from the Zionist Council for ‘outstanding services’? No, it wasn’t something she ever mentioned over coffee). Well, Alan met Ros, and before long they were in Melbourne: Ros taking care of their three boys before taking up librarianship in TAFE, and Alan with his own advertising business and eventually making it into print with highly-regarded short stories and novels. 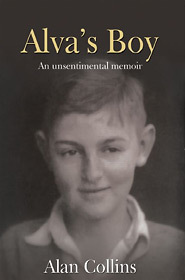 But Alan died before his memoir Alva’s Boy was published, and it was up to Ros, the poet Alex Skovron and Anna and Louis at Hybrid Publishers to make it happen. Alan’s book is set in the Sydney of the 1940s and 1950s, and his historical allusions all needed to be verified: the wording of advertisements, Australian slang of the period, the dates of major events such as the opening of the Harbour bridge, the Japanese submarines in Sydney harbour, newspaper headlines. It was a suitable task for a librarian. Choosing a book cover was a challenge; I wanted a picture of young Alan, but few were ever taken of him as a child. A tiny photograph of an eleven-year-old boy was made into a haunting cover and we decided that Alva and Bondi Beach would be the perfect complement for the back. It’s the last two lines that say it all. His other books are also dedicated to me and the boys, but here in absolute nakedness is the core of his being. Alan had never dared hope for a family, and as a child he was known as ‘poor Alva’s boy’. The phrase must have burned his soul. It’s not Belsen or Auschwitz. No turnips or Siberian prison camp, no fleeing across Europe, but who are we to judge pain? Manfred once told Alan that although the reffo kids had suffered unimaginable torments and deprivations, and many had lost their parents, they all knew that, unlike him, they had once been loved. (p. 272-273). In her introduction, Ros says that Alan’s books are significant contributions to Australian literature and that her memoir is just fossicking through my memories, teasing out what was funny, romantic or sad – and perhaps provocative. I think that Solly’s Girl is much more than that – but you’ll have to read it yourself to decide if that’s because I’m biased! Karenlee Thompson loved it too, see her enthusiastic review on her website. the Jewish Museum in Alma Road. Or if you’d like to order the book direct, click the link to download the orderform. I’m glad you liked it too, Lisa. I was blown away by how inclusive the writing is, drawing the reader in to Ros and Alan’s world. Oh goodness me, you needn’t have worried about that. I do hope things are going okay in Qld. Ah, but I know how much my readers like your reviews (I can tell from my stats!) and I meant to… it was just that I was doing a million things – booking transport, cancelling appointments, packing etc. We’re getting by up here, and I’ll be going home soon.